Make a Creamy Chicken, Bacon & Tomato Pasta in just 20 minutes! 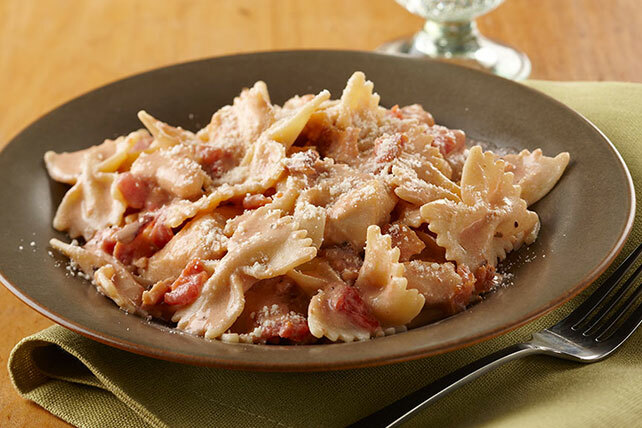 This deliciously cheesy Creamy Chicken, Bacon & Tomato Pasta dish is great for weeknights. Meanwhile, cook chicken in large skillet on medium heat 5 to 6 min. or until done, stirring occasionally. Add all remaining ingredients except Parmesan; mix well. Cook 3 min. or until Neufchatel is completely melted and chicken mixture is heated through, stirring frequently. Drain pasta; place in large bowl. Add chicken mixture; mix lightly. Sprinkle with Parmesan. Some cooks prefer to drain the pasta well to prevent excess water from diluting the sauce, while others like a little moisture to help prevent pasta from sticking together. In any case, reserve a few tablespoons of cooking water to add to pasta if it starts to stick together or if you want to dilute the sauce.